Get there early, because it's going to be crowded. About 3,000 to 4,000 Tibetans from exile communities in Washington, New York, and Canada are expected to travel here for the Oct. 26 ceremony. They'll gather on Independence Mall, swelling a crowd that usually numbers 1,200 to 1,500, to support and honor one of the world's celebrated human-rights advocates. "We're so excited and thrilled," said Tsering Jurme, a leader in the Tibetan Association of Philadelphia. "All the Tibetan community is excited and looking forward to this day." It's a big autumn for the Dalai Lama, who turns 80 on July 6 - and for Philadelphia, which will welcome Tibet's spiritual leader a month after hosting Pope Francis during the World Meeting of Families. "The Dalai Lama has been under consideration for the Liberty Medal for years, and we were thrilled this was the year he was able to accept and able to come to Philadelphia," said Jeffrey Rosen, president and CEO of the Constitution Center. "He's been a global conscience for tolerance, dialogue, and compassion." The Dalai Lama's work in writing a democratic constitution for Tibet - which China occupies and claims is an integral part of its territory - is especially important to the concept of the Liberty Medal, Rosen said. The medal, established in 1988, annually honors men and women who strive to secure liberty for people around the globe. It comes with a $100,000 prize. In a statement issued through the Constitution Center, the Dalai Lama said, "I have made it my life's work to spread the message of kindness and compassion, and I can think of no better place to be recognized than in the City of Brotherly Love and Sisterly Affection." 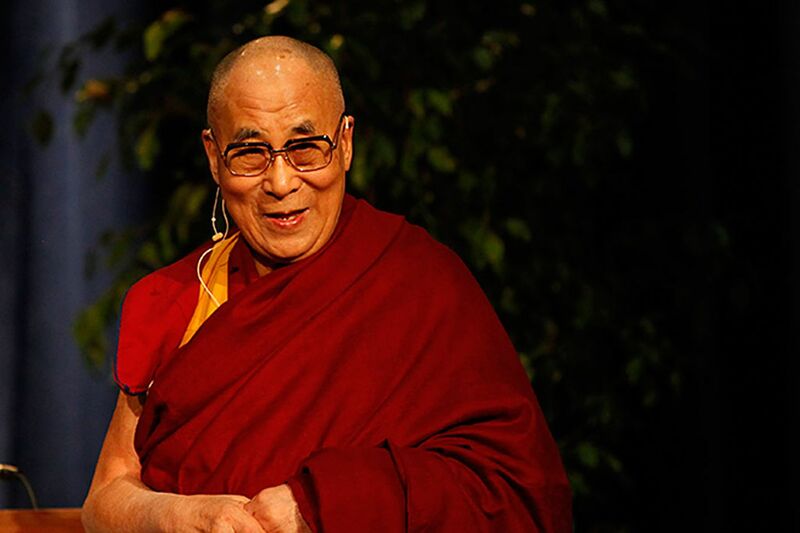 Local Tibetan leaders said the Dalai Lama will hold a teaching at La Salle University on the day of the ceremony, and give a public talk at Temple University the day after receiving the award. Ticket information for those events is pending. "I'm thrilled beyond words that he's coming," said Karma Gelek, a past president of the Tibetan association. "It's a great, great feeling. I'll be there when he comes." Gelek has met the Dalai Lama in California, in India, wherever he can afford to travel to hear him speak. Early next year, Gelek and his family plan to attend a teaching in India, where the Dalai Lama and a large Tibetan community live in exile. About 11,000 Tibetans live in the United States. The Tibetan community in the Philadelphia area has grown in recent years but remains small, about 150, with newcomers arriving from other states and from Dharamsala, India, home of the Tibetan government in exile and the Dalai Lama. News of the medal comes as Tibetans around the world prepare to celebrate the Dalai Lama's birthday - and amid concern over his successor and the treatment of Tibetans by Chinese authorities. In the last six years, 141 Tibetans have set themselves ablaze to protest Chinese rule. Of those, 114 are known to have died. Twenty-four of the protesters who self-immolated were under 18, according to the International Campaign for Tibet. In Tibet, human-rights groups say, the Tibetan flag and national anthem are banned, and possession of a picture of the Dalai Lama can result in torture and imprisonment. Rosen said the Constitution Center had heard nothing from Chinese authorities about the medal. The Chinese government often protests when the Dalai Lama receives an award or meets with foreign leaders. On Wednesday night, Chinese embassy spokesperson Zhu Haiquan said tremendous progress has occurred in Tibet and "the human rights situation there is the best in history." "The Dalai Lama is a political exile who has long been engaged in anti-China separatist activities under the cloak of religion," Zhu said. "We urge the relevant parties to respect the history and the facts, recognize the true face of the Dalai Lama, and stop using Tibet-related issues to interfere in China's internal affairs." The man born Lhamo Dondrub in Amdo, Tibet, is the 14th and longest-lived Dalai Lama. At the age of 2, he was recognized as the reincarnation of the previous Dalai Lama. He was called to assume full political power in 1950, after China invaded Tibet. The failed Lhasa Uprising in 1959 resulted in the Dalai Lama's flight into exile. He has since traveled the world, advocating for Tibetans, teaching Buddhism, and extolling the virtue of kindness. He also has angered the Chinese government by condemning what he has called "cultural genocide" against Tibet. Today, tensions dominate the discussion over who will succeed the Dalai Lama when he dies, a process that traditionally involves identification by senior monks. Chinese officials assert that the choice rests with them - and were angered by the Dalai Lama's suggestion that he might decide to not reincarnate. China, wanting a pliable successor, has warned that he must reincarnate. In its announcement that the Dalai Lama would receive the Liberty Medal, the Constitution Center noted that he has been an advocate for greater global equality and the right of all people to peace, happiness, freedom, equality, and dignity. He was awarded the Nobel Peace Prize in 1989. Previous Liberty Medal winners include Pakistani girls-rights activist Malala Yousafzai, former Secretary of State Hillary Rodham Clinton, and the boxer Muhammad Ali. "As a practicing Buddhist, I'm just thrilled that the Liberty Medal committee and the National Constitution Center had the bravery to give it to his holiness," said Ken Klein, a Philadelphia grocer and member of the Tibetan Buddhist Center. "It's a wonderful recognition for his lifelong goal of nonviolence."